Birmingham Business School is exploring the use of artificial intelligence and advanced big data analytics in its delivery of distance-learning programs. A new research project will examine the ways in which the latest technologies can be applied to foster more personalized learning online. “We are pioneering a new way in the delivery of fully-accredited online MBAs and master’s programs,” says Roshan Boojihawon, director of Birmingham’s Online MSc International Business. Birmingham already stands out as a business school at the cutting-edge of educational technology – edtech – innovation. Last year, its Online MBA became the first and only fully-online MBA to be accredited by AMBA. Its Online MSc International Business is set to follow suit. Across Birmingham’s Online MBA and Online MSc International Business, 63% of students are international with 47 nationalities represented. 47% of students are men. With new developments in artificial intelligence, the plan is to bring students together in a more personalized learning environment; to replicate and better the tailored support offered by tutors in an offline course. “Online, we’ve got the analytics,” explains Daniel Chicksand, director of Birmingham’s Online MBA. “We can see exactly where students are in the program, how much time they’ve spent on a particular page, and how they navigate through the learning experience. With the rise of new technologies, the days of the lonely long-distance learner are over. On both Birmingham’s Online MBA and MSc, fortnightly ‘live sessions’ connect tutors, lecturers, and groups of up to 25 students, in an immersive online learning environment. The sessions are two and a quarter hours long. “The future is for more flexible learning programs,” says Daniel. “The Online MBA is in no way an easy option. The expectations for students are the same. In fact, students have to be more self-motivated and organized to fit their studies around their work. Roshan doesn’t see the rise of free alternative online courses as a challenge to an established, and accredited, business school model. 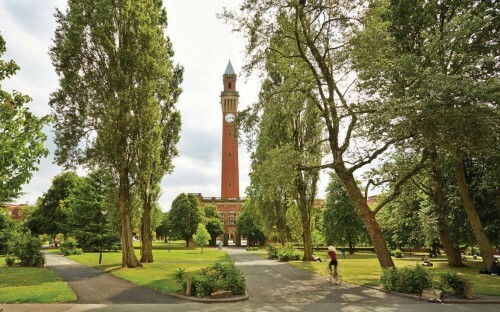 The University of Birmingham produces its own Massive Open Online Courses (MOOCs). It’s part of FutureLearn, the first UK-led MOOC learning platform.